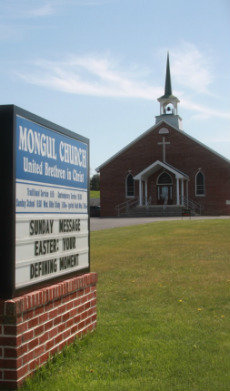 Mongul Church is located at 4162 Roxbury Road in Shippensburg, Pennsylvania. Turn West onto Spring Street (at the Turkey HIll gas station just South of the Fayette Street intersection). You will follow this road the whole way out to the church (Spring Street turns into Roxbury Road). After the bulk of the residential area, you will pass the Roxbury Ridge apartment complex on your left. From there it is about 3 miles to the church. The church will be on your left. Exit I-81 at the King Street exit (29), making a right at the end of the off ramp onto PA-174 (towards Rt 11). Follow that road until you come to a T, turning left there onto King Street (Rt 11). After about a mile there will be a Turkey Hill gas station on the right. Turn right onto Spring Street (just before the Turkey Hill). Follow that road, driving approximately 3.5 miles. The church will be on your left. Exit I-81 at the Fayette Street exit (24), making a left at the end of the off ramp. Follow that road until you come to a T, turning left there. This will take you in to Route 11. You will turn left at the light heading towards the Turkey Hill gas station. Turn right onto Spring Street (just before the Turkey Hill). Follow that road, driving approximately 3.5 miles. The church will be on your left.